(Inside Science) -- Nearly 30 years ago, the state of Washington and two federal agencies agreed to clean up the Hanford Nuclear Reservation, a 586-square-mile chunk of sagebrush desert where the U.S. produced plutonium for nuclear weapons starting 75 years ago. In the process, half a trillion gallons of chemically toxic and radioactive waste was dumped on the ground or injected into groundwater. Some of it has reached the Columbia River. Another 56 million gallons of concentrated, radioactive sludge and crystallized salts sit corroding within 177 steel-and-concrete underground tanks. Although the tank waste is only a fraction of the total, its safe disposal is one of the site's most urgent priorities, especially to the policymakers and residents of Washington and Oregon. Eighteen years ago, workers began constructing a plant for "immobilizing" the remaining waste by vitrifying it -- a process whereby it is mixed with molten glass, cooled and encased in stainless steel canisters for long-term storage underground in an as yet undesignated location. Today the task remains unfinished. Prominent among the reasons for this is that designing, building and operating the infrastructure to treat the waste may be the most complicated project of its kind ever attempted. And that's because the waste itself is, well, complicated. Although plutonium is no longer being created at Hanford this most peculiar element continues to loom ghostlike over the government's efforts to mitigate the damage its creation caused and prevent any further environmental and human risk for centuries to come. Construction of the world's first plutonium production reactor began at the site in 1943. During World War II and throughout the Cold War, the U.S. made some 67 metric tons of plutonium at Hanford. Its reactors bombarded uranium-238 with neutrons to produce plutonium-239, the isotope best suited to producing big controlled explosions like the Fat Man bomb burst over Nagasaki in 1945. Hanford had nine plutonium production reactors, numerous other buildings, and waste pits and dumps that in total became four Superfund sites. Every bombardment produced a chain of fission products, each with its own half-life and decay chain. The extremely long half-life of some of these byproducts (tens of thousands of years) dictates that the waste must be contained for longer than most humans can imagine, let alone ensure its active management. But the problem is not just radiation: The waste's chemistry, too, can make the problem appear insoluble. Once the plutonium was created, it had to be separated chemically from the uranium. And since the Manhattan Project was the first of its kind, a great deal of waste was generated before Hanford experts devised the efficient and widely used PUREX process. The decision to vitrify Hanford waste was made right after production of plutonium stopped in 1987. To this end, construction of the Hanford Tank Waste Treatment and Immobilization Plant -- also known as the "Vit Plant" -- began in 2000. The original agreement between the state of Washington and the federal government called for complete vitrification by the end of 2018. However, the plant is still under construction. There have been delays, cost overruns, poor oversight of contractors, agency restructuring, policy roadblocks and administrative snafus. At the Washington Department of Ecology, the state's primary Hanford watchdog, people have had to stretch their imaginations to accommodate Hanford's dilatory progress, said Cheryl Whalen, the agency's cleanup section manager. 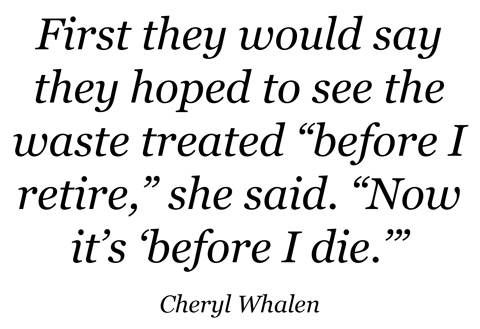 First they would say they hoped to see the waste treated "before I retire," she said. "Now it's 'before I die.'" The 1989 Tri-Party Agreement between the Department of Energy, the Environmental Protection Agency and the State of Washington obligates the DOE to finish the cleanup. The EPA regulates the levels of radionuclides and chemicals that can be allowed in the environment under the Comprehensive Environmental Response, Compensation, and Liability Act (aka the Superfund law), the Clean Water Act, and other federal laws. The Washington Department of Ecology regulates the toxic chemical side under the federal Resource Conservation and Recovery Act. The DOE must comply with all of these laws. The original plan for the Vit Plant called for construction to start before the plant design was finished. This resulted in numerous delays when design flaws and unanswered technical questions arose. Current plans provide for the waste streams to be separated into high-level waste and low-activity waste. Until a geological repository is designated and constructed, the high-level waste canisters will be stored above ground at Hanford. The low-activity waste canisters will be stored permanently in on-site trenches. About 90 percent of the total waste volume is classified as low-activity waste: It consists mostly of the liquids, less their cesium, strontium and technetium. About 90 percent of the radioactivity comes from the high-level waste, which occupies far less volume but contains most of the remaining radiation. Over the last 75 years, the waste in each tank has settled into layers with different physical and chemical properties. At the bottom there's a "hard heel" of solid crud. Above that is a layer of sludge the consistency of peanut butter. Above that sits a large volume of liquid, and a crust of evaporated salts tops the liquid. Finally, the gases escaping the waste haunt the headspace under the tank lid. The liquids have been pumped out of many of the oldest, single-shelled tanks to prevent further degradation of the steel, leaving the tank interiors with remarkably grotesque accretions of crud, sludge and crust awaiting further treatment. Scary -- but how dangerous? The thought of both radiation and toxic chemicals tends to make people uneasy. And according to David Clark, who studies plutonium (Pu-239, half-life 24,100 years) at Los Alamos National Laboratory, most people fear the element because of its association with nuclear weapons. However, if it's not in a bomb or misbehaving at a nuclear power plant, it's generally only harmful if a person ingests or inhales it. Two other, more concerning, fission products, cesium-137 (half-life about 30 years) and strontium-90 (half-life almost 29 years), will constitute the greatest amount of radioactivity in the Hanford waste for the next century. These two elements created so much heat in the tanks that much, but not all, of their mass has been removed to canisters kept cool underwater elsewhere at the site until the vitrification plant begins treating high-level waste. Currently that startup date is 2036. Although the whole point of Hanford was to enrich plutonium for use elsewhere, there is still enough left in the waste, dense and insoluble, to make some experts nervous. It only takes about 10 kilograms to start a chain reaction. In 2012, most construction of the vitrification plant was suspended after the General Accountability Office released a highly critical report, and two years after the Defense Nuclear Safety Board expressed strong concern that enough plutonium might collect somewhere in the plant -- in the giant melters where the waste is mixed with molten glass-forming minerals, in the million feet of piping, or elsewhere -- to initiate a chain reaction. A second major concern has been hydrogen, which is continually liberated by both radioactivity and chemical reactions in the waste. If enough of it gathers in pockets in pipes or headspaces of tanks and melters, it could explode. But by 2017, the Department of Energy was assuring Hanford stakeholders that these issues, along with many others, have been resolved well enough to begin vitrifying low-activity waste in 2022. Not everyone is sanguine. The Hanford Vit Plant is 20 years behind schedule. Have we even identified all the problems, let alone solved them? 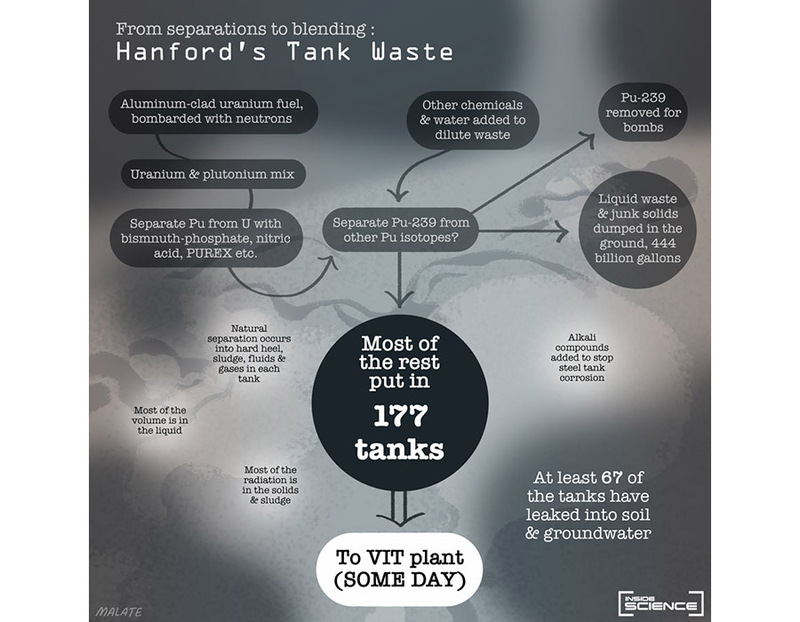 Nuclear power plant waste is successfully vitrified in many countries -- but in most, only one chemical separation process to create fuel is used, whereas Hanford employed three major processes and several variations. And in terms of vitrification, the influence of chemistry far outstrips that of radiation. "I can tell you, as a glass scientist -- there is not one radioactive component that in any way enters into consideration of making a durable glass," said Alfred Kruger, a senior glass scientist at the DOE's Office of River Protection at Hanford. It's all the other elements that cause the trouble -- so much so that "textbook chemistry doesn't work at Hanford," said Hanford chemist Vince Panesco in remarks to a February 2018 National Academy of Sciences panel. Whalen agrees. "You've got thousands of compounds and the chemistry is constantly changing," she said. 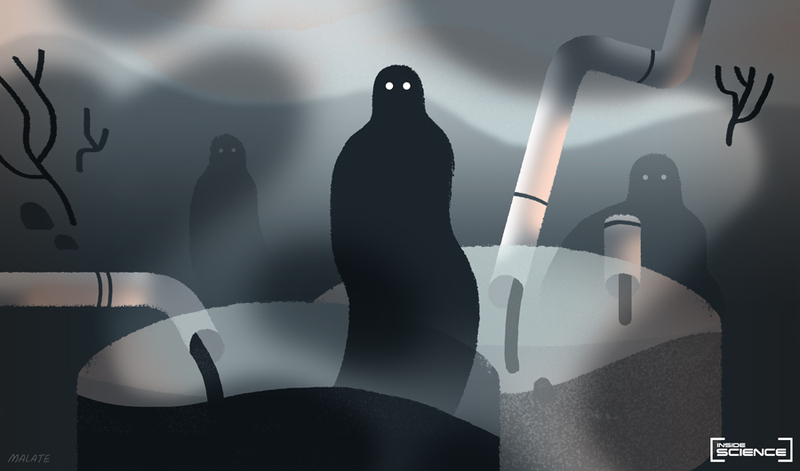 "They've already formed a lot of compounds that were never originally put in the tanks." And as it turns out, plutonium, widely feared for its radioactivity, has proved to have several unforeseen chemical tricks up its sleeve. One of them actually gave workers more ways to separate it from uranium. Number 94 in the periodic table, plutonium is two spaces over from uranium. This means it's a chemically toxic heavy metal like lead, mercury and bismuth, whose chemistries are relatively well-understood. But plutonium's electrons behave oddly. All the elements to the left of plutonium in the periodic table are quite willing to share electrons with each other, gaily forming compounds hither and thither; the elements to the right, far less so. But, said Clark, plutonium can go either way: Put it under pressure and it will be hands across the water with those left-hand elements; put it in a vacuum and it closes its borders like its right-hand neighbors. It's the only known element with this two-faced property, and how that affects its chemical behavior is incompletely understood. Plutonium also has six oxidation states (i.e., it can gain or lose up to six electrons), up to four of which can coexist in an acidic chemical environment. This unique property gave Hanford workers more ways to separate the plutonium, because they could selectively precipitate out each oxidation state with different chemicals. Thus, while there are numerous historical records as well as decades' worth of scientific studies and analyses available, the waste is still not fully understood. The mix of radionuclide chemistry and "regular" chemistry creates uncertainty, and often it seems that solving one problem triggers a cascade of new ones. All the separation processes involved strong acids. Both radiation and acid cause steel tanks to corrode and degrade. So the Hanford workers added huge amounts of sodium hydroxide to neutralize the acid. Also added during the separation process: organic compounds including kerosene, trichloroethylene, hexone, tributyl phosphate and carbon tetrachloride, as well as inorganics including sodium bismuthate, hydrofluoric acid, sodium dichromate, sulfuric acid and diatomaceous earth. The organics helped precipitate plutonium out of its soluble forms, said Kruger. But they too can cause problems in the glass. For example, about 100 tons of cyanide were added to the waste as part of cesium removal, but cyanide can produce toxic gases in highly alkaline environments. Early on, tank temperatures and risks that might result if the waste dried out after liquids were removed were a major concern because one explosion might push the contents' temperature higher and set off a series of them among these constituents. Major explosions have been avoided so far, largely because the tank temperatures appear to be much lower than levels that could set off thermal reactions. The uranium fuel from which the plutonium was extracted was clad in aluminum sleeves to prevent uranium's fission products from escaping into the cooling water surrounding the reactor or the nearby environment. The cladding dissolved, making all that aluminum available to react with new nitrogen compounds that can crystallize in the glass melt. Crystals in the glass are undesirable; glass is an amorphous substance, meaning its atoms form random shapes, like marbles in a bowl, rather than the lattices comprising crystals. Ideally, the waste materials are uniformly distributed in the glass so that they can't keep playing musical chairs and forming new combinations that could compromise the integrity of the glass and allow either toxic chemicals or radiation to escape. Then there are the halides -- fluorine and chlorine compounds. Most of these entered the waste as an unintended consequence of using cheap sodium hydroxide, Kruger said. "Halides are not your friend in making glass, or dealing with steel," he added. "That limits the amount of halides that can be processed." This is a common problem with vitrification because if the waste contains too much of one chemical or another, the molten mix may behave in undesirable ways in the melter or fail to vitrify into a smooth glass column. For example, high amounts of bismuth in the melt may cause the molten mixture to foam, and if the foam persists it will leave many bubbles in the cooled glass. Further, although fixes have been developed for many such problems, sometimes these methods reduce the amount of waste that can be mixed with the glass, which adds to the total number of canisters that will be necessary. In addition to the heavier elements, the regulators require technetium-99 (half-life 211,000 years) and iodine-129 (half-life 15.7 million years) to be controlled. Unlike the heavy metals, both of these are highly soluble and highly volatile, which means they can escape solids and liquids. During vitrification, the temperatures required to melt the glass will be high enough for them to depart the melt. They must be captured and returned to the waste stream at some point. Technetium-99 has created a radiochemical mystery. According to Clark, chemists assumed that it would react with oxygen to form pertechnetate, which they knew they could remove with what are called ion exchange columns. That would solve the problem of technetium escaping. But that's not what all the technetium did: A considerable percentage formed a still-unidentified compound that the ion exchange columns don't capture. Despite all the scientific uncertainties, scientists and managers at Hanford are confident the waste can be vitrified and that the major safety worries have been put to rest. The vitrification plant includes a lab to sample each tank's contents, and adjustments can be made in the pretreatment section before the waste is piped to the melters for its union with glass-forming chemicals. The borosilicate glass selected for the task is adaptable enough to vitrify when any of a number of chemical additives are added to the recipe. Upon this fact rests the hope of cleanup. If we assume the waste will eventually be immobilized, will it be a miracle or a testament to research and engineering ingenuity? "It's going to be somewhere in between," said Washington Department of Ecology's Dan McDonald, who monitors the design and operation of the vitrification plant. "It's amazing how much waste was created to create our nuclear weapons," said Ken Niles, administrator of nuclear safety at the Oregon Department of Energy. "It was a huge undertaking to build the arsenal, and it needs to be the same to restore the environment." Even if the optimism of the scientists and engineers is well-founded, it will still take almost two more decades for the vitrification plant to run at full bore. So it may be 2047 -- or later -- before the ghosts of plutonium are finally laid to rest. Valerie Brown writes about science from Eugene, Oregon. She has been published in Science, Scientific American, Bioengineering Today, Environmental Health Perspectives, Pacific Standard, and In These Times, among others. She has been recognized by her peers for her explanatory journalism.